Thread: Need roof cross bars...and a basket. All - I recently purchased an Ebony VX - right now, she's in the shop getting some various minor (and maybe not so minor - we'll see) work done, but in the near future, I wanted to add a basket and lights. For that, I need roof cross bars. Now, I'm not insistent that the bars be OEM (that would be nice, but I am being realistic at the moment) - so I am wanting to know if anyone can recommend any non-OEM bars that are known to fit the VX without needing much (ideally any) modification to the VX or the bars themselves. I've seen a couple of threads here from other VX owners who have used non-OEM bars - but they had to do some mods to the bars or such. I've also heard that the OEM bars were from Yakima - can they still be bought new (non-OEM badged, of course)? I'm wondering if any of the bars off Ebay or Amazon could work - but I don't want to drop some cash on something that I have to go through the hassle of returning if it doesn't. Maybe it might be better to shop locally via a 4x4 shop of some sort? Thank you for any help or advice you can give me. YAKIMA def doesn't make them or have any parts for them anymore. I've talked to them so I'm 100% sure of this. ...do you have any rec's for other non-OEM cross bars (besides those which have already been posted on this forum)? What exactly should I be looking for in a "universal" cross bar in order to have a snowball's chance that it can be made to fit? I don't know the details on any of the Non-OEM bars people have used. I recall one member did a pretty detailed thread on how he did it. I'll see if I can find it. I do have A TON of very detailed pics of every aspect of the OEM racks, including the clamps/brackets and towers. I can email them to you. I still routinely check for any OEM racks that may come up for sale on ebay and cragislist etc.... So if I come upon one I'll give you a shout. When I bought mine it came with an aftermarket rack. Think its just a suction one. I'll try to take pictures tomorrow. 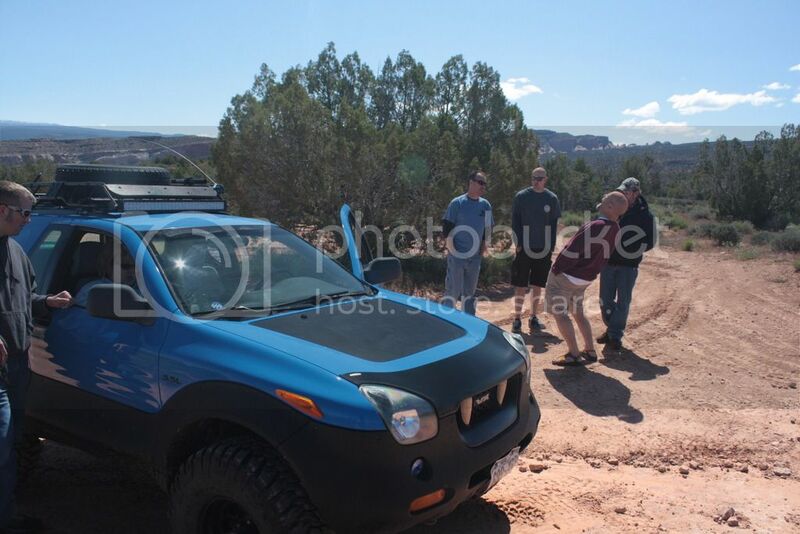 After some research here on the forum - I noticed that some people are mentioning the Yakima Railgrabber towers (with round crossbars). They look like they just might work. Once I get my VX back outta the shop, I'm going down to REI and try fitting some up. Yep, Yakima rail grabbers are great. I'm probably the one who posted about them previously... they're solid, fit easily & low profile. 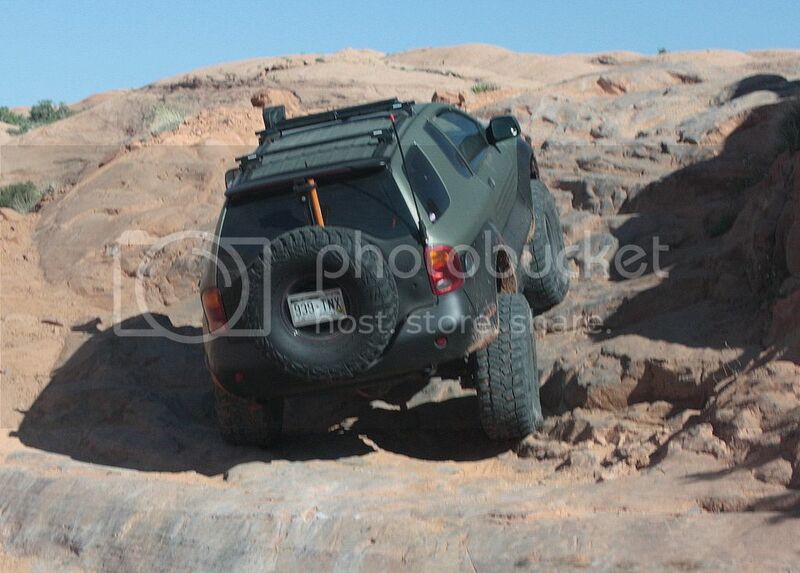 Slighly blurry rock crawling photo to somewhat show the roof rack because I wanted to use a more recent pic. I used the Rola basket for a short bit. It wasn't very expensive and seemed like it could handle some weight. I also like the Rhino rack basket. It fits the VX the best out of any basket I've seen but you lose a little bit of cargo space with it's inward design. VXorado, how do the baskets attach? For example the Rola basket? These are Yakima brackets that came with my Yakima Warrior cargo basket. You can see the attaching brackets in these pics. The top and bottom bracket are curved to grip the cross bars. Since our bars are quite oval, these brackets fit extremely well. The top and bottom bracket are then tightened together with the vertical bolts you can see, and tighten with the triangle knob that can be hand tightened. There's a rubber strip on both top and bottom of the cross bars, and the Yakima brackets in these pics also have a rubber type material that contacts the bars, further helping to prevent slippage. The Rola basket came with very similar mounts to the ones Sue pointed out above. You can usually expect a mount that will clip onto round or oval bars, although I've had Yakima accessories (ski-rack) that came with mounts for the round bars only. In both pictures of the Rola and Rhino Rack, custom mounting was done to keep the baskets lower. I made some mounts that went directly on the roof rails and Scott mounted the basket underneath the cross bars. What is exactly length of OEM Yakima cross bars?